more than two thousand years ago, was pointed out to succeeding ages by the lofty mound, around which many a tourist has since lingered, and which, to this day, marks the spot where the Athenian heroes fell. May not imagination, as it seeks to portray the future of this great American Republic, without any overstraining of its powers, see the coming time, distant it possibly may be, but none the less desirable or certain, when her sons from every State shall seek this little hamlet for its hallowed memories of the past, and coming from the South as well as North, reunited in fact as well as theory, in affection as well as formality, shall stand here together as pilgrims at a common shrine, and forgetting the feuds of the past, save only the mighty powers which their results developed, mutually admit, as they appeal to the records of this field, that they have sprung from the same stock, and united in the same destiny, entitled to the same respect, and animated by the same heroic and patriotic impulses ? This day, my countrymen, (the 17th of September,) happens to be the anniversary of another event in our political history, not less memorable than the one which to-day, more particularly, engages our attention; in some respects it is so intimately connected with the considerations which the occasion suggests that it is scarcely proper it should pass without notice. It was upon this day eighty years ago that the representatives of our ancestors, with Washington at their head, after four months' deliberation, adopted the Federal Constitution—an instrument so remarkable for the circumstances that gave birth to it, for the wonderful prosperity which sprung from it, for the reverence with which from generation to generation it has been handed down to us, that there has probably been no record of a like character which has exerted so important an influence on the history of a government or the rise and progress of a people. The political condition of the country at the time of its adoption, in some of its aspects, was not unlike the present. 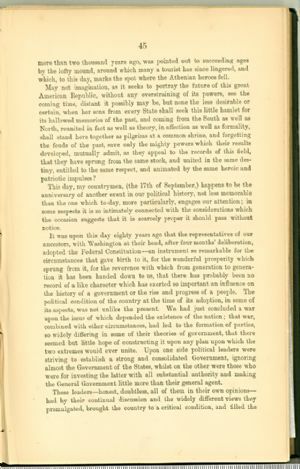 We had just concluded a war upon the issue of which depended the existence of the nation; that war, combined with other circumstances, had led to the formation of parties, so widely differing in some of their theories of government, that there seemed but little hope of constructing it upon any plan upon which the two extremes would ever unite. Upon one side political leaders were striving to establish a strong and consolidated Government, ignoring almost the Government of the States, whilst on the other were those who were for investing the latter with all substantial authority and making the General Government little more than their general agent.